The motivating effect that rewards have on behaviour is universally recognized, though the exact role of pleasure is still debated. Is pleasure a determining factor in whether an individual evinces a particular behaviour, or simply a concomitant of the behavioural response? Either way, the motivations that drive our behaviour appear to be intimately linked to pleasure. Our most powerful motivations come from behaviours that have proven beneficial to our species from an evolutionary standpoint. Specialized systems in the brain have thus evolved to give us pleasure when we engage in these behaviours. The brain has two major pathways that help to activate behaviours: the reward circuit, which is part of the medial forebrain bundle (MFB); and the punishment circuit, or periventricular system (PVS). Both the MFB, through the desire/action/satisfaction cycle, and the PVS, through the successful fight or flight response, lead the organism to behave in a way that preserves its homeostasis. Together, they form the behavioural approach system (BAS). 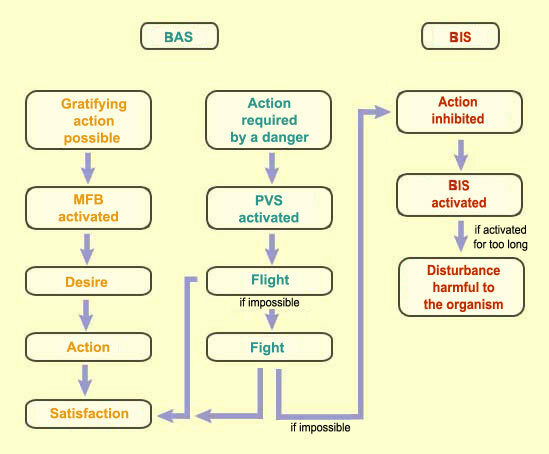 Opposing the BAS is the behavioural inhibition system (BIS), characterized by Henri Laborit in the early 1970s. Stimulation of the BIS causes an overall inhibition of behaviour, thus working against the BAS. Under natural conditions, the BIS is activated when we observe that our actions will be ineffective. When fight or flight appears impossible, very often the only choice left to ensure survival is to submit and accept things as they are. The BIS is the result of an evolutionary history in which this system made itself useful by operating intermittently, temporarily preventing any useless actions that could only have made matters worse. For example, consider a small mammal in the middle of a field who suddenly sees a bird of prey flying overhead. The best thing to do is not to move, in the hope of not being seen. In human societies based on competition, many people activate their behavioural inhibition system continually, to avoid reprisals. In such cases, the inhibition of behaviour is no longer merely an adaptive interval between approach and avoidance behaviours, but instead becomes a chronic source of anxiety. This sense of uneasiness gradually undermines the individual’s health. Indeed, the inhibition of behaviour has many negative consequences, and they have been abundantly documented. The most obvious ones are psychosomatic illnesses, stomach ulcers, and arterial hypertension. But prolonged activation of the BIS can also lead to more serious genetic disorders such as cancers and all of the pathologies associated with impaired immune function.